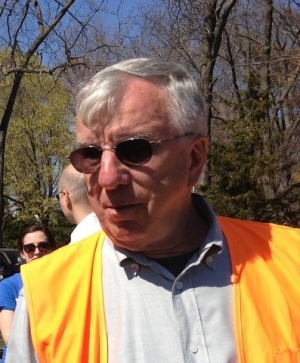 John Moeling has been elected president of the Norwalk Land Trust to fill an unexpired term and the nonprofit has voted to terminate a contract to acquire a half-acre property at 2 Nearwater Rd. on the Farm Creek peninsula in Rowayton as a public bird and nature sanctuary. Both developments emerged from a meeting of the board of directors at the historic stone barn on the Farm Creek Preserve. Moeling succeeds Kathy Siever as president for the remainder of her term extending through 2014 until the annual meeting in January of 2015. In a statement after the meeting, Moeling said the decision to rescind the contract to acquire the property was made "after it became clear the contract was unenforceable." The vote means the land trust will seek to recoup a down payment to Bruce Beinfield, the property owner, and also return dedicated contributions made by the public to fund the acquisition of the property. Moeling's statement noted: "During the past three weeks, as the campaign to keep the property as open space continued, the land trust received threats of law suits and warnings of punitive action if we refused to agree to a cancellation of the contract." In June a majority of members of the Pine Point Association voted against the plan to create the nature preserve, many expressing concerns that a sanctuary would generate problematic traffic through a private neighborhood. "We are certainly grateful to the many volunteers who have supported the Farm Creek Preserve in the past years," noting that included "the large majority of Pine Point residents." Moeling, 71, joined the land trust board in 2009 and has been active in an education initiative that has given nearly 3,000 Norwalk fourth-graders hands-on exposure to the natural sciences at the Farm Creek Preserve. He retired as president of Scientific American, Inc., the New York magazine publisher, and lives in South Norwalk with his wife Barbara.